Anesthetic management of TASVC and heterotaxy syndrome requires detailed assessment of cardiac and extracardiac anomalies and thorough knowledge of its pathophysiological effects. We report anesthetic management of a case of TASVC to the left atrium (LA), with left isomerism. An 11-year-old female patient weighing 25 kg presented with a history of fatigue for 2 years, cyanosis for 2 months and occasional palpitations. There was no history of squatting or cyanotic spells. There were no symptoms suggestive of congestive heart failure. On examination, pulse rate was 60/min, BP was 100/60 mmHg, jugular venous pressure was not elevated and room air oxygen saturation was 80%. Cardiovascular examination revealed normal first heart sound and single second heart sound and a grade 2/6 ejection systolic murmur. Her hemoglobin was 18.6 g/dL, with hematocrit of 51.42%. She had serum bilirubin of 1.3 mg/dL and serum creatinine of 0.8 mg/dL. ECG showed p wave appearing after QRS complex and no evidence of left or right ventricular hypertrophy. On chest X-ray, there was no cardiomegaly, pulmonary vascular markings were normal and both domes of diaphragm were at the same level. Preoperative echocardiogram showed that the patient had situs solitus, osteum secondum atrial septal defect (ASD), left to right shunt and interrupted inferior vena cava (IVC). Superior vena cava (SVC) was draining to left-sided atrium, There was an enlarged LA, noncompaction of left ventricle (LV) and normal biventricular function. Contrast echocardiogram delineated the entry of agitated saline into left-sided atrium from SVC [Figure 1]. Cardiac catheter course was from SVC to left-sided atrium and then to right atrium (RA), right ventricle (RV) and the pulmonary artery. Pulmonary venous saturation was 99%, there was desaturation at LA (80%), and no further change in the saturation was found at RA, RV or PA.
Computed tomography (CT) angiography was performed to confirm venous anomalies, and diagnosis of left isomerism was made with polysplenia and bilateral left-sided bronchi, midline liver. There was interruption of the IVC with azygous continuation, with the hepatic vein joining the LA separately [Figure 2]. After the investigations, the patient was diagnosed as a case of TASVC and left isomerism. Preanesthetic concerns were about polycythemia, altered coagulation profile and rhythm abnormalities. Goals of anesthesia were prevention of air embolism and to avoid drugs known to precipitate arrhythmias and to avoid drugs known to cause myocardial depression as non-compacted LV may be predisposed to myocardial dysfunction and intravenous bolus injections reach coronary circulation faster in TASVC. On the day of surgery, the patient was premedicated with tab diazepam 5 mg 1 h before surgery. Preoperatively, hydration was maintained by IV fluids. In the OR, the radial arterial blood pressure was 100/60 mmHg and pulse rate was 60/min. General anesthesia was induced with midazolam 2 mg, ketamine 50 mg and glycopyrrolate 0.2 mg. Endotracheal intubation was done after muscle relaxation with vecuronium. Right internal jugular vein was cannulated with a 7 French double-lumen central venous catheter. Anesthesia was maintained with isoflurane 0.5-1% in oxygen-air 50%, and boluses of fentanyl 25 mcgs and vecuronium 1 mg. During prebypass period, care was taken to avoid air embolism. Once the pericardium was opened, the preoperative findings were confirmed [Figure 3]. Anticoagulation was achieved with heparin 100 mg and ACT was 782 s. Ascending aorta, SVC and suprahepatic IVC draining the hepatic veins were cannulated and cardiopulmonary bypass (CPB) initiated. Cold blood cardioplegia was given through aortic root after applying the cross-clamp. Left-sided atrium was opened and there was a membrane dividing the same into two parts, which was initially confused to be the atrial septal defect. Left side of the membrane was receiving pulmonary veins and, on right side of the membrane, SVC, hepatic vein and coronary sinus openings were noticed. The RA was rudimentary, which was opened through right-sided atrial appendage. Tricuspid valve was inspected and was of adequate size. Atrial septal defect was enlarged, membrane in the LA was excised and the SVC, hepatic vein and coronary sinus were rerouted to the right atrial cavity with baffle repartitioning using pericardial patch. The RA was enhanced with pericardial patch and closed. Total bypass time was 116 min and aortic cross-clamp time was 92 min. Cardioplegia was repeated twice. The minimum temperature on CPB was 28 o C. CPB was conducted with a flow of 2.4 L/min/m. 2 After rewarming to 36 o C. Dopamine 5 mcg/kg/min was started electively and the patient was weaned from CPB without any difficulty. Protamine was given after achieving surgical hemostasis. Postoperatively, hemoglobin was maintained at 10 g/dL. Arterial saturation was 100% after surgery. The patient was weaned from the ventilator and extubated after 4 h in the recovery room. Postoperative echocardiogram showed an intact interatrial patch, no residual ASD, SVC and hepatic veins with suprahepatic IVC draining to RA. Biventricular function was normal. Anomalous systemic venous drainage consists of anomalies of SVC, IVC, and TASVC. Persistent left SVC is the most common systemic venous anomaly, whereas there are less than 20 cases of TASVC reported in the world literature. Maape et al. reported a case of TASVC with bilateral SVC and hypoplastic RA and RV. Diagnosis of TASVC was done when the child was 4 months old. The child presented with cyanosis without episodes of hypoxic spells. The patient was operated at the age of 15 years when she developed dyspnea on exertion. Complete surgical correction was not possible as RV was hypoplastic and hence bilateral bidirectional Glenn and rerouting of IVC and coronary sinus to RA were performed. TASVC patients are prone to paradoxical embolism. In a case report by Mogadam et al.,  a cyanotic child with left hemiparesis and convulsions was diagnosed to have TASVC by contrast echocardiogram and angiocardiography. Schick EC Jr et al. reported a case of anomalous SVC that was diagnosed incidentally during pulmonary artery catheter insertion after acute myocardial infarction. The patient was acyanotic and did not undergo surgery for anomalous SVC. He died of brain abscess 4 years later. They recommended surgical correction of such conditions even if patients are asymptomatic. Ze-Wei et al. classified TASVC into two types. In type I, IVC is not interrupted and in type II, there is IVC interruption. Miller et al. and Gueron et al. reported children between the ages of 3 and 15 years with diagnosis of TASVC who were successfully operated by rerouting the systemic venous drainage to RA. TASVC is a cause of cyanosis and clubbing in patients with no other signs of heart disease. TASVC draining only through the SVC to LA with interrupted IVC and noncompaction of LV is a rare association. When TASVC is part of heterotaxy syndrome, detailed evaluation of all the associated malformations is required. Attention should be paid to preoperative hydration and relief of anxiety, avoiding air embolism. Intravascular volume should be maintained and pulmonary vascular resistance should not be allowed to rise. Noncompaction of LV, which was an associated feature in our patient, can lead to LV dysfunction. It requires avoiding cardiodepressant drugs and thorough deairing before removal of the cross-clamp. Perioperatively, patients with left isomerism should be closely monitored for arrhythmias. 1. Perloff JK. Clinical recognition of congenital heart disease. 5 th ed.USA: Elsevier Sciences; 2003. p. 38-42. 2. Julia Berba- Maape, Ludgerio D, Torres, Eduardo Manrique. A case of TASVC to LA. Phil Heart Centre J 2002;9:834-44. 3. Mohammed Yousef Arabi Moghadam, G. Omani, K. Sayad Poor. 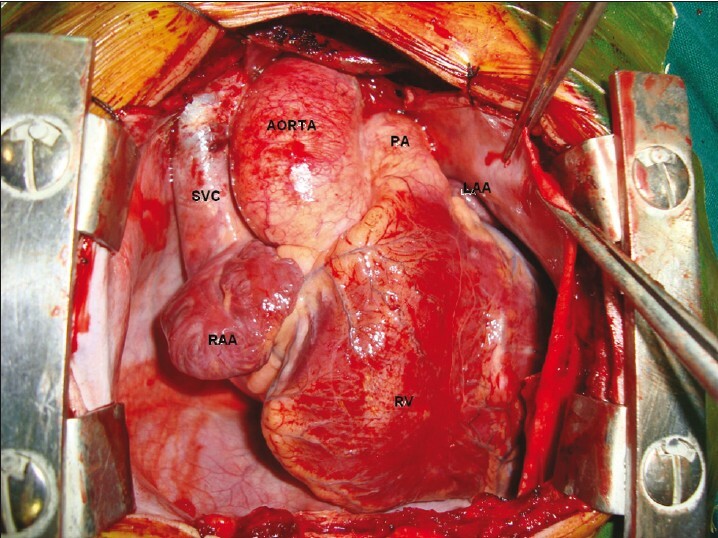 TASVC to right sided atrium with left atrium morphology; A case report. Iran Heart J 2004;5:61-4. 4. Schick EC Jr, Lekakis J, Rothendler JA, Ryan TJ. 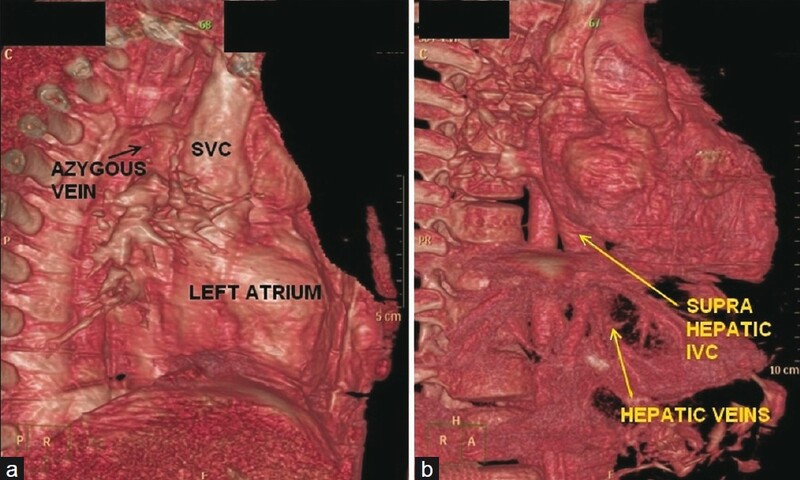 Persistent left superior vena cava and right superior vena cava drainage into the left atrium without arterial hypoxemia. J Am Coll Cardiol 1985;5:374-8. 5. Zhang ZW, Duan QJ, Gao Z, Ru W, Ying LY. Total anomalous systemic venous drainage to the left atrium. Ann Thorac Surg 2009;87:1599-601. 6. Millers GA, Ongley PA, Rastelli GC, Kirklin JW. Surgical correction of total anomalous systemic venous connection: Report of case. Mayo Clin Proc 1965;40:532-8. 7. Gueron M, Hirsh M, Borman J. Total anomalous systemic drainage into the left atrium. Report of a case of successful surgical correction J Thorac Cardiovasc Surg 1969;58:570-4. 8. Marcelletti C, Di Donato R, Nijveld A, Squitieri C, Bulterijs AH, Naeff M, et al. Right and left isomerism: The cardiac surgeon's view. Ann Thorac Surg 1983;35:400-5. 9. Williams GD, Feng A. Heterotaxy syndrome: Implications for anesthesia management. J Cardiothorac Vasc Anesth 2010;24:834-44. Authors of Document Vallath, G., Gajjar, T., Desai, N.